Ten minutes and four slides. That’s what a Washington Department of Health staffer responsible for warning the public about contaminants in fish was allotted to impress then-Health Secretary Mary Selecky about the importance of the issue. Lots of luck, warned former Department of Health toxicology chief Rob Duff — Selecky and her crew are “skeptics” who “are not very interested” in environmental health. That was early 2008. In the months that followed, Health Department staffers would continue to raise contaminated fish as a public health issue, records and interviews show. Among their concerns: a long-known error in the state formula that controls how much toxic pollution can be dumped into waterways by factories, sewage-treatment plants and other polluters. The U.S. Environmental Protection Agency has since repeatedly warned the state to fix the error. Now, a year and a half into the Inslee administration, the governor is scheduled to announce his plan today in Olympia. At issue is a state pollution-control formula that bases the amount of water pollution permitted on how much fish people are thought to be eating, an estimate known as the fish consumption rate. So the less fish people eat, the more pollution can be allowed. But Washingtonians’ fish-eating is much higher than the rate used in the formula, particularly among Indian tribes and other heavy consumers of local fish, according to studies dating to the mid-1990s. The governor is in a tough spot politically. Indian tribes and environmentalists say people deserve more protection from pollutants such as mercury and PCBs. But other key Inslee constituencies including the Association of Washington Cities and some labor groups have aligned with Boeing, as well as the Greater Seattle Chamber of Commerce and other business interests, saying that if the pollution rules are tightened, there is no technology available to meet the discharge limits that would result. And yet regardless of Inslee’s announcement today, no fix is likely for years to come, continuing a pattern of delay going back more than half a decade. Instead of correcting Washington’s estimate of fish consumption when the issue was first raised in 2008, officials decided to wait for Oregon to act first. Washington Health Department toxicologist David McBride pointed out that Oregon’s effort to rewrite the pollution formula was based almost entirely on surveys conducted in Washington showing that estimates of fish consumption rates were too low, especially for members of Indian tribes but even for average consumers. Once Oregon increased its official estimate of how much fish people eat in 2011, then-Ecology Director Ted Sturdevant tried to do the same in Washington. As InvestigateWest previously revealed, that effort was ultimately scotched by former Gov. Christine Gregoire at the behest of a Boeing executive. Both under Inslee now, and Gregoire before, the Department of Health has been a junior partner in formulating state policy on the issue, taking second seat to Ecology, which holds the regulatory power to make polluters cut their pollution levels. And in the Inslee administration, with the governor taking on the issue directly, Ecology’s role has waned as well. McBride, the Department of Health staffer who has pressed most for more protective standards, said in an interview that the message from health staffers hasn’t changed for years. Numerous studies back McBride’s point. He highlighted two, one a national report that found 10 percent of mothers giving birth each year pass along the toxic metal mercury at levels thought to affect the child’s development, such as lowering IQ. That’s 410,000 kids annually. In Washington, six percent of women registered those levels, with more potentially at risk: 10 percent of pregnant women and 12 percent of women of childbearing age in the state reported eating sport-caught fish each month and about two-thirds are eating fish from stores, according to the second study. 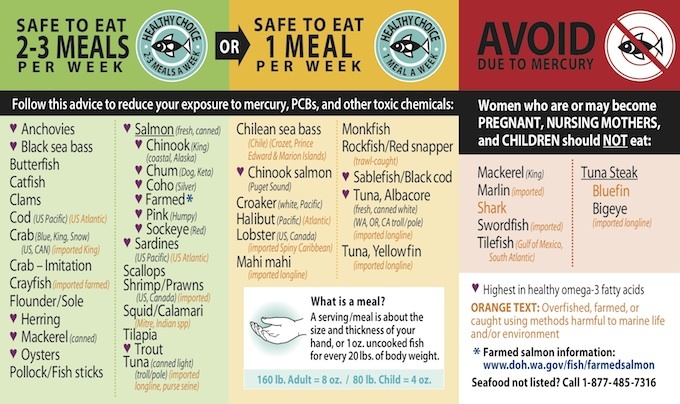 The overture from the Health Department staffer in 2008 did lead to the Health Department testing a program of warning seafood consumers right at the point of sale at a few Olympia-area grocery stores. Even though significant numbers of consumers reported noticing and understanding the warnings, that program never got taken past the pilot stage. The terrible shape of the state budget at the time was a huge factor, says former Health Secretary Selecky, who also disputes Duff’s characterization of her office as not too interested in fish consumption or environmental health. Duff said in an interview his note was not meant to disparage Selecky, only to warn the junior staffer that the secretary was spending so much time on other issues such as smoking and vaccinations that she might not have interest in something new. Six and a half years later, Inslee today will have to face the issue. One key factor that Inslee will have to address is how many cases of cancer the state should allow as a result of eating toxics-tainted fish. Traditionally that number has been one person in 1 million who are exposed – essentially zero. But Inslee has privately proposed allowing ten times that much, one case for every 100,000 people eating fish. That could set up a huge confrontation with federal EPA, which oversees Washington’s administration of the water-pollution limits at issue. Last week the head of EPA’s Seattle-based Region 10, Administrator Dennis McLerran, wrote to Washington state Sen. Doug Ericksen, chair of the Senate Energy, Environment and Telecommunications Committee, to say EPA does not approve of allowing additional cases of cancer. EPA is being sued by environmentalists, who want the federal agency to take over the whole process. But EPA is stretched thin already. Even if Washington state goes ahead, it will probably take several years before a new rule can be put into place and start working to actually protect consumers. “Public health has a role to play in looking at fish consumption and the impact on human health. How can we have a seat at this table? Is there a staff role or a role on the group?” he asked. Sturdevant answered: “Good question. Let me raise this with the gov tomorrow.” There is no indication in the records released to InvestigateWest that the question was ever answered. Inslee spokesman David Postman was unwilling in a recent interview to reveal the direction Inslee plans to head – but he gave a hint. “The task in front of us was not to just propose a new fish-consumption rule, but what can we do to keep the water clean and prevent pollutants and toxics from getting into the water,” Postman said. That portends a long-rumored wild card in Inslee’s announcement today, one that apparently will seek to reduce the burden on industry by pledging public funds for some kind of broad pollution-reduction strategy, probably involving the stormwater pollution that flows off hardened surfaces such as streets and parking lots. Today Inslee is expected to spell out what that public investment will be, and how it can help industry and other regulated facilities as they struggle to meet tighter pollution limits. Kim staffs InvestigateWest's research desk and is a liaison to our community of readers. Kim joined InvestigateWest after a career working on environmental issues in the public sector and as a consultant. The documents in this collection are a mix of publicly available reports and Washington State Department of Ecology records obtained by InvestigateWest through a Public Records Law request.